Unlike mammals, insects are invertebrates, meaning they lack an internal skeleton. Instead, they posses non-living exoskeletons located on the outside of their bodies. This exoskeleton protects the insect's internal organs, prevents it from drying out, attaches to the insect's muscles and allows the insect to gather information about its environment. Understanding these benefits of the exoskeleton helps explain why having a skeleton outside the body makes sense for insects. Insects are protected by their exoskeletons. This hard outer covering prevents easy access to the more vulnerable internal organs. Underneath the exoskeleton, insects have an epidermal layer similar to human skin. But the exoskeleton forms a kind of armor over the epidermis in much the same way that medieval armor protected the skin and organs of knights in battle. 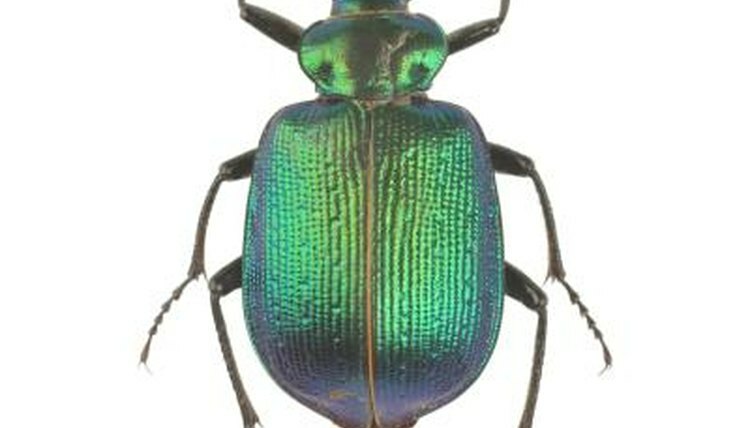 Additionally, the exoskeleton successfully repels parasites, fungi, viruses and other biological invaders so insects can stay safe and healthy.Furthermore, pigments responsible for creating the color patterns on insects that serve to ward off potential predators are produced in the exoskeleton. Insects’ exoskeletons are secreted from their epidermis and form three layers: the endocuticle, the exocuticle and the epicuticle. The epicuticle is the topmost layer and is actually waterproof. The epicuticle's primary role is to help the insect keep in its water so it doesn't dry out. Additionally, the epicuticle stops water from coming into the insect's body, which could drown it. Both feats are accomplished thanks to a layer of waxy molecules inside this layer that form a waterproof barrier. Because the exoskeleton is made from a carbohydrate substance known as chitin, it actually stays moist on its own. In humans and other mammals, muscles do not attach directly to bones. Instead, they are connected via tendons and ligaments. In insects, however, muscles are directly attached to their exoskeletons. Because the exoskeleton is not a single surface but consists of multiple jointed plates, the insect's muscle movement causes the connected exoskeleton plate to move as well. This muscle/plate movement allows insects to move around. Because of this method, insect muscles have a nearly unlimited area for their attachment, allowing for greater variability in movement. Insects gather sensory information about their environments through mechanoreceptors, chemoreceptors and photoreceptors. The first two types of receptors are often located in the insect's exoskeleton (the third appears in the compound eyes and ocelli). Mechanoreceptors pick up information about movement or location around the insect. For example, the campaniform sensilla are flat oval receptors in the exoskeleton that detect it bending. The layers of cuticle which form the exoskeleton also contain chemoreceptors responsible for tasting and smelling. These receptors are usually located on hairs or plates. University of Massachusetts: Is That an Insect?